ColecoVision.dk Homebrew Section Presents: Ricardo Oazem. Ricardo is located in Brazil. Ricardo Oazem a very talented MSX developer and member of the MSX company Tecnobytes. He has years of experience in the MSX platform, and many expansion devices commercially released for it. He created the Video and Sound Unit (VSU), a very big and new soundbar extension called: OPL4 Shockwave. It's made out of 4 V9990 chips, 2 V9958 chips and an OPL4 chip. His technic is used in Sunrise Graphics 9000 and Sunrise's Moonsound cartridge. Ricardo use a 1Mb Sample RAM DAC to improve the sound quality. The box with the VSU capable unimaginable things in the system. Photos can be scanned at very reasonable quality and the audio portion can handle mp3. 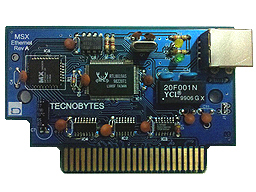 Ricardo has together with Tecnobytes produced a little Ethernet card for the MSX platform. For TCP / IP connection of LAN and FTP server. 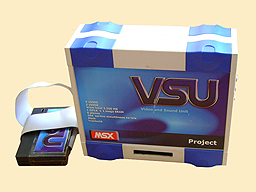 This card is a great solution for sharing files between PC and MSX. The card also allows programs to download images from the Internet via FTP so you do not have to keep moving your CF between the two computers. Earlier also the Powergraph and ATA IDE Interface for MSX too. Ricado will together with Eduardo be the man behind the new ColecoVision 2. And since ColecoVision and the MSX structure is closely related to each other, communication will be less cumbersome. The specifications are secret for now, but will be published as soon as Eduardo at OpCode Games says: go for it. I can say so much that the new CV2 will be 99% backward compatible. Default detection will be CV+SGM. You will be able to run all regular ColecoVision games + all extented super games. In CV2 mode is where all the new stuff will be mapped in. No matter the mode, can CV2 accept all the ColecoVision controllers. Ricardo Oazem and Eduardo Mello have no plans of any expansion, so no ADAM or Atari module. There you will have to use the "old" 1982 classic ColecoVision. To get in touch with Ricardo Oazem, try this: e-mail.